Grief and Bereavement forum groups • View topic - How to live life after your womb was ripped away? Post subject: How to live life after your womb was ripped away? 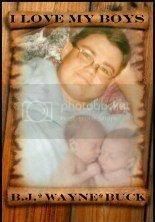 My loving son, Patrick, became a spiritual Angel on July 15, 2009 unexpectedly in his sleep at the age of 20. But, Patrick was always an Angel in his physical earth. Four months and fifteen days, I had four beautiful sons: Steve, Frederick, Patrick, and Kevin, and today, I still have four sons. For Patrick is still in my life, my heart, my soul. Patrick's pictures are in every corner of our home so is his presence. Today, I am still breathing because I desperately want to see, meet my beloved son. I don't know what to do, think or where to go for the moment. I have lonely, empty days, restless nights. HOW DO YOU DO IT? Post subject: Re: How to live life after your womb was ripped away? I'm so sorry. I know what kind of pain you have to live with as I have three sons in Heaven. Nothing ever makes it ok, we just learn with much time how to live with the pain. I visited Patrick's site, what a wonderful son you were blessed with. My heart goes out to you.